From mobile, cable-free re-charging of electric vehicles, smart phones and laptops to collecting solar electricity from orbiting solar farms, wireless power transfer (WPT) technologies offer consumers and society enormous benefits. Written by innovators in the field, this comprehensive resource explains the fundamental principles and latest advances in WPT and illustrates key applications of this emergent technology. The fundamental principles of WPT to practical applications on dynamic charging and static charging of EVs and smartphones. Theories for inductive power transfer (IPT) such as the coupled inductor model, gyrator circuit model, and magnetic mirror model. IPTs for road powered EVs, including controller, compensation circuit, electro-magnetic field cancel, large tolerance, power rail segmentation, and foreign object detection. IPTs for static charging for EVs and large tolerance and capacitive charging issues, as well as IPT mobile applications such as free space omnidirectional IPT by dipole coils and 2D IPT for robots. Principle and applications of capacitive power transfer. Synthesized magnetic field focusing, wireless nuclear instrumentation, and future WPT. 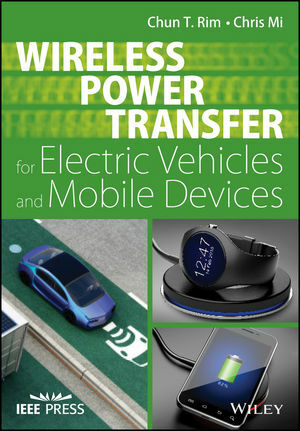 A technical asset for engineers in the power electronics, internet of things and automotive sectors, Wireless Power Transfer for Electric Vehicles and Mobile Devices is an essential design and analysis guide and an important reference for graduate and higher undergraduate students preparing for careers in these industries. DR CHUN T. RIM developed the wireless power transfer (WPT) of on-line electric vehicles that was selected as 'the 50 Best Inventions of 2010' by TIME and 'the first of 10 emerging technologies in 2013' by the World Economic Forum. Dr. Rim also developed WPT for stationary EV charging, mobile devices, robots, and drones. He demonstrated the first 5m and 12m distance WPT using innovative dipole coils and also envisioned new theories for WPT such as magnetic mirror, gyrator circuit model, and phasor transformation. Since 2013, Dr. Rim has served as an Associate Editor of IEEE Trans. on Power Electronics (TPEL) and IEEE JESTPE. He also served as a Guest Editor of Special Issue on WPT at TPEL, JESTPE, TPEL, and Trans. on Industrial Electronics. He has served as the General Chair of 2015/2016/2017 IEEE WoW and published more than 160 articles, 14 books, and 150 patents, mostly on WPT. DR. CHRIS MI is a Fellow and Professor at San Diego State University. His research interests are in electric and hybrid vehicles. He has taught tutorials and seminars on the subject of HEVs/PHEVs for numerous government agencies and global companies. Dr. Chris Mi started his research in wireless power transfer (WPT) in 2008. His team has developed a number of unique topologies of WPT systems, including the double sided LCC-compensated topology, the large power capacitive wireless power transfer (CPT) technology, and low-ripple dynamic WPT. Dr. Mi is an Area Editor of IEEE Transactions on Vehicular Technology and was an Associate Editor of IEEE Transactions on Power Electronics and IEEE Transactions on Industry Applications.